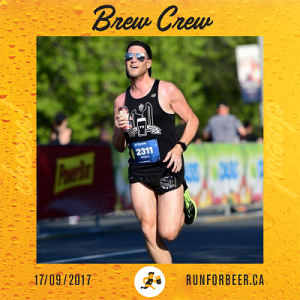 How long have you been a member of RunTOBeer? Since Day 1 (RunTOBeer was my idea, after all)! What started as two strangers meeting to run to a brewpub grew into our weekly series of brewery-sponsored events throughout the GTA and beyond. I’ve done more than 100 scheduled beer runs since then. Is this your first or second time doing the Famous Canadian Beer Run? What are you most looking forward to on event day?